Three 18-hole Pete Dye golf Resort courses, plus Golf Zoo can now provide access to the private La Romana Country Club for a total of 90 holes of world-class golf! Whether you choose to travel in peak golf travel season (November-March), or off-peak season, golfers must plan to visit and play. Today, it is easier and much better value to travel to Casa de Campo due to the special Stay & Play Packages offered by Golf Zoo, plus more flights, from more North American and European cities than ever before. "El dente de perro", or Teeth of the Dog, opened in 1971 and has been ranked in the Top 50 of the World's Greatest Courses since. Without proper heavy machinery to crack the ultra-hard and white seaside coral, tireless workers used sledgehammers, pickaxes and chisels to carve greens and tee boxes out of coral formations, resulting in 7 spectacular holes on the Caribbean Sea. 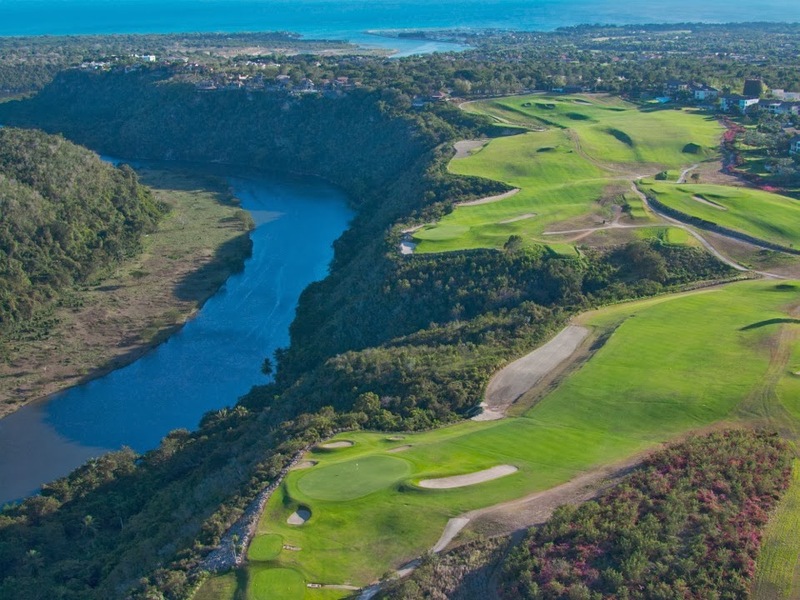 Four seaside holes on the front-nine, three on the back-nine, plus the best series of par-3 holes you can play anywhere - #5, #7, #13, and #16. Hole #5 is one of the most photographed holes on the course...and the world! Teeth of the Dog is a course you could play every day and never get tired of playing it. Every hole is very different, every hole has a different intimidation factor (thanks to Mr. Dye), but all players will enjoy the course. No matter your round score, you will be delighted to have played this great course. This equally scenic Club features three nines that meander from high above the El Chavon River, across steep elevations down toward Casa de Campo Marina before returning to the Dye Fore Clubhouse at the edge of Altos de Chavon Village. The views are simply spectacular and big is the word to describe Dye Fore. The fairways are wide, the bunkers over-sized and the large greens have huge undulations for players to navigate. Golfers of all levels will be challenged to play shots from different lies, with many significant elevation drops and rises. After a round at Dye Fore, spend the afternoon, or evening in the Altos de Chavon Village dining and/or enjoying a cocktail at one of the local village sidewalk cafes or restaurants. Located adjacent to Teeth of the Dog, The Links course winds through the interior of Casa de Campo where rolling hills, lakes and woodlands create plenty of challenges. Both courses share the same Pro Shop and Practice Facility offering a perfect setting for 36-hole days. Mr. Dye oversaw a course renovation in 2011/2012 - re-creating a beautifully landscaped, conditioned and little more challenging course.